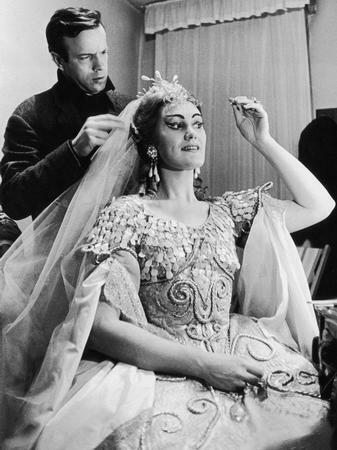 1960: Australian opera singer Dame Joan Sutherland being helped with her costume before a performance in Venice. All photos courtesy of Getty Images. Luciano Pavarotti, Joan Sutherland and Spiro Malas in Donizetti's 'La Fille du Regiment' at Covent Garden Opera House. 1959: Italian conductor Carlo Maria Giulini, producer Walter Legge and soprano Dame Joan Sutherland check the score of 'Don Giovanni' in the playback room during the recording for EMI at Kingsway Hall, London. 1978: Prince Charles with Dame Joan Sutherland at the Australian Musical Foundation's Inagural Gala Concert at the Royal Opera House, Covent Garden, London. The 27th Annual Kennedy Center Honorees class poses from L-R: (back row) Warren Beatty, Ossie Davis, John Williams, (front row) Sir Elton John, Ruby Dee and Joan Sutherland at U.S. Department of State December 4, 2004 in Washington, DC. Dame Joan Sutherland, the Australian soprano singer, being showered with flowers on stage at Covent Garden. Paris, France: Joan Sutherland, and her husband, Richard Bonynge, thank the audience, 23 November 2006 in Paris, during the Charles Cros Academy (the French equivalent of the US Recording Academy) award ceremony.